Beautiful shallow reef packed with huge schools of goatfish stretched out like yellow ribbons between the coral heads. 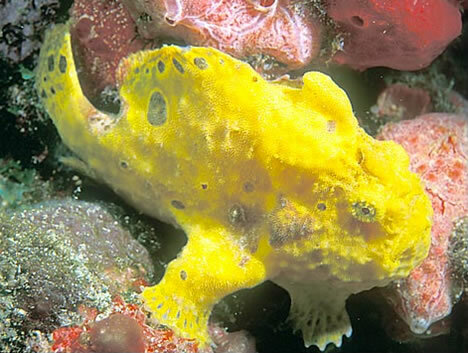 Several small eels, two scorpionfish, three brightly colored nudibranchs, and one well-disguised frogfish rounded out the dive. I wish I could have spent more time diving this spot, but when customers are paying I have a obligation to get them back to the boat with plenty of air in their tanks. Very strong current throughout the dive. We started with a ten minute swim against the current out to a shallow pit that turtles frequent for cleaning. Two large wild Hawaiian turtles cautiously approached us as we lay in the pit, one coming mere feet from the group. On the return an incident with a customer caused us to miss the line and turned the dive into an impromptu drift. All was good in the end; Captain Scotty knows how to handle his vessel and keep customers safe.